The village of Blagaj in Bosnia and Herzegovina can be found hugging the blue-green Buna River, a mere 7km South of Mostar. 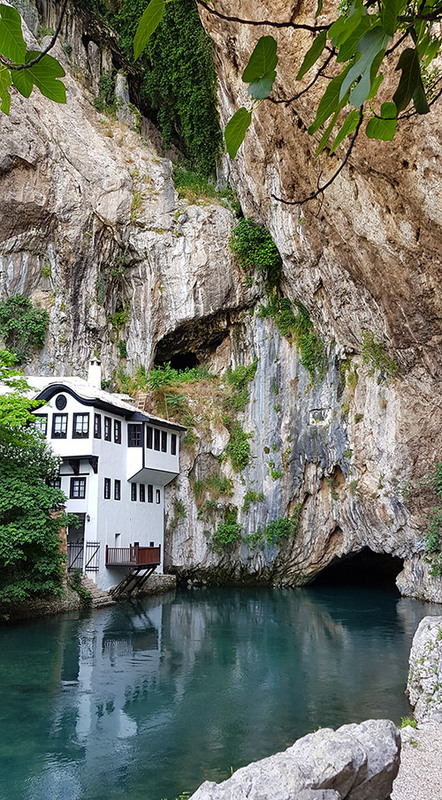 It is considered one of the most mystical places in the whole of Bosnia and Herzegovina and is the site of the Blagaj Tekija, a 15th Century Sufi house for dervishes. Alongside the historic Tekija, the Vrelo Bune spring erupts from a cave as the source of the Buna River. It is most definitely worth the trip to see nature, history and Ottoman architecture at it’s best. Tucked into the base of an imposing 200m high cliff, the tekke (dervish house) is the most visited monastery in the country. It was built in the early 15th Century by dervishes with the following message: “Love creatures for the sake of Creator”. In the past, it was a home of Kadiri, Rufai, Khalwati and Nakhshibendi dervishes – not to be mistaken with the whirling dervishes. The complex of the tekke includes tombs, rooms for prayers, musafirhane (guest room), the kitchen, hamam (bathroom), courtyard and abdesthane (washroom). The house is fully furnished with plush Persian rugs on the floor. There is a quiet reverence and peacefulness to the site and being a sacred place you are required to cover your shoulders, knees and head when entering. A rack of scarves is provided for all visitors to use to cover themselves. The cost for entry is €2.50 for adults while children are for free and a souvenir shop, the proceeds of which go towards repairing the monastery. Alongside the Blagaj Tekija is a cave from which an underground karst river flows out to create the Buna River. It is one of the largest and most beautiful springs in Europe, with an average water flow of 43,000 gallons per second. You can take a short boat ride into the cave to see the impressive karst cavern and learn about its uniqueness. Don’t forget to fill your water bottle with some of the purest water you can find on earth! 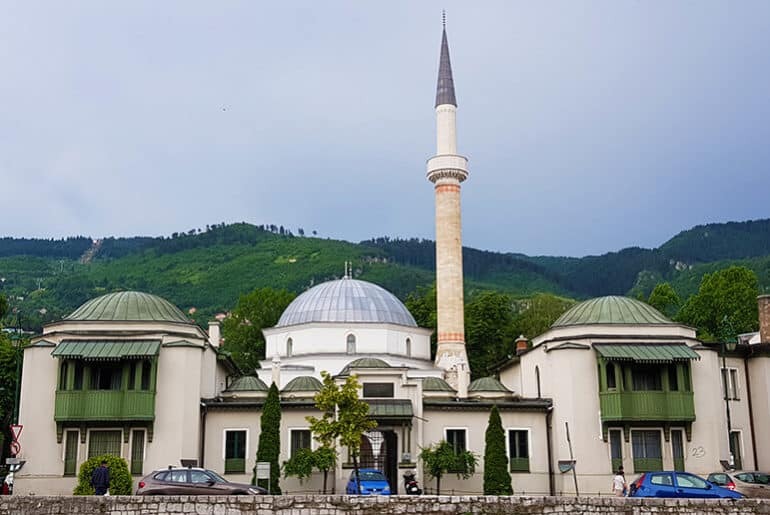 The water is icy cold and provides much-needed cooling of the air during the hot Bosnian summers, which was probably the reason for the location of the tekke. There are a few restaurants lining the river where you can make the most of the cool breeze while sipping on an ice-cold drink and drinking in the natural wonders around you. 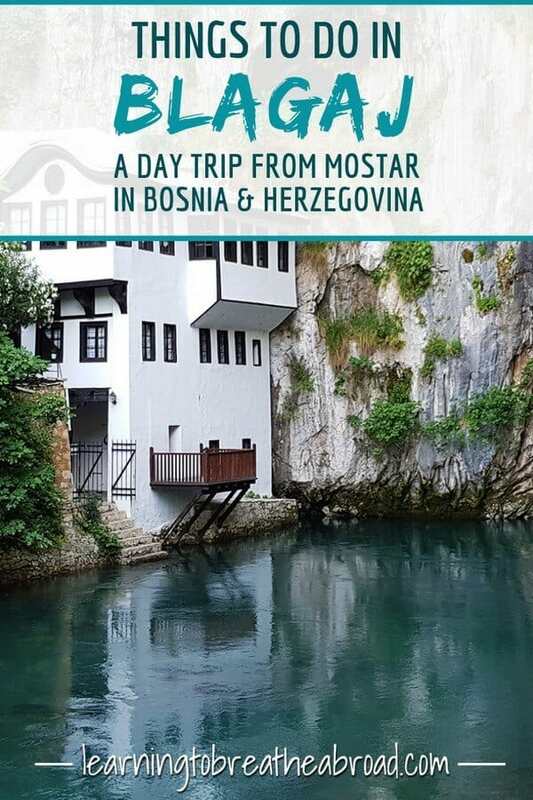 Blagaj is easily accessible by local bus from Mostar for those of you without your own wheels. If you are driving, there is a car park at the entrance to Blagaj Tekija, but at 6 Euros, you may want to find another place to park. 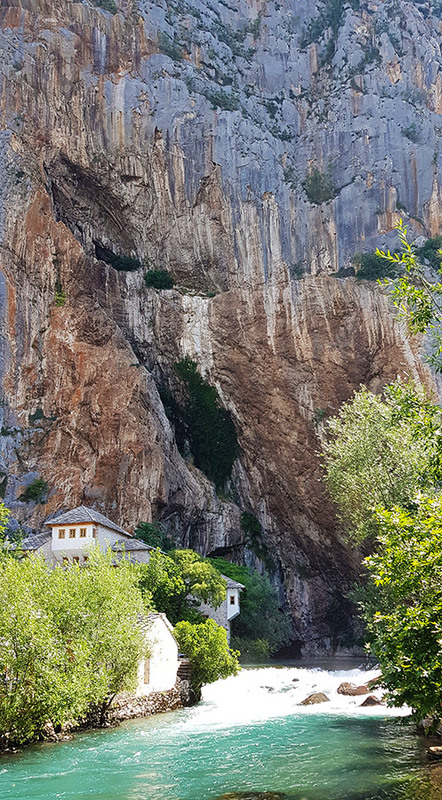 From the car park, it’s just a few minutes walk to the Blagaj Tekija, with lots of roadside stalls to tempt you along the way. 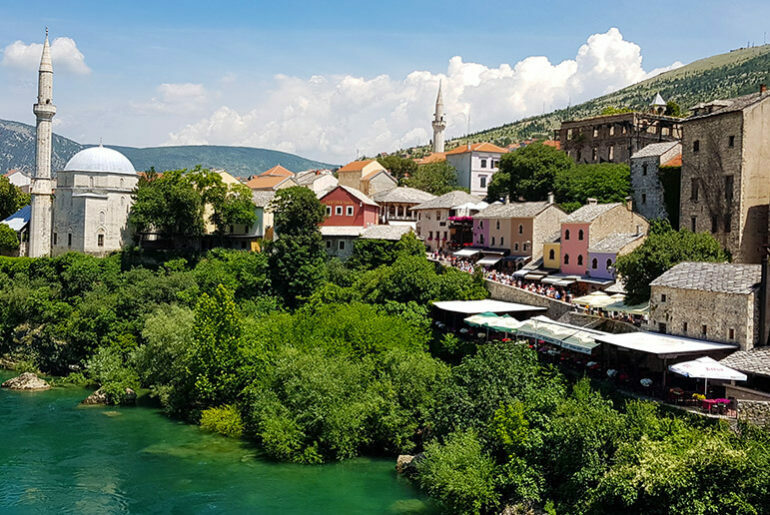 Although Blagaj is a really small town, they have a number of accommodation options and the Sufi House is only a few minutes walk from the centre of town so easily walkable from where ever you may stay. Find the best deals on accommodation in Blagaj here. If you are there in the heat of summer you may want to look at staying on the river in Buna. The water is absolutely freezing but when its super hot out, all you need is a quick dip to cool down. Find the best deals on accommodation in Buna here. 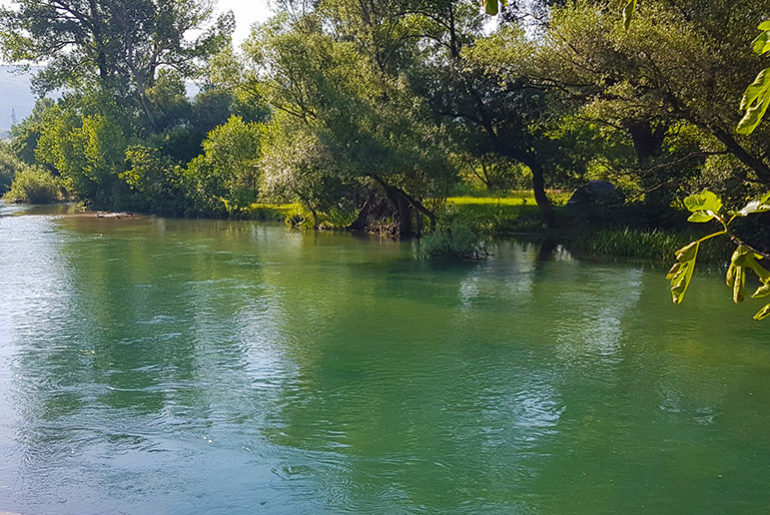 We stayed at Auto Camping EKO situated 5 minutes from Blagaj on the Buna River. A full services campsite and they will cook for you! 5 Euro a meal and the portions were huge! 10 Euro per night to camp and 2 Euro for the washing machine.